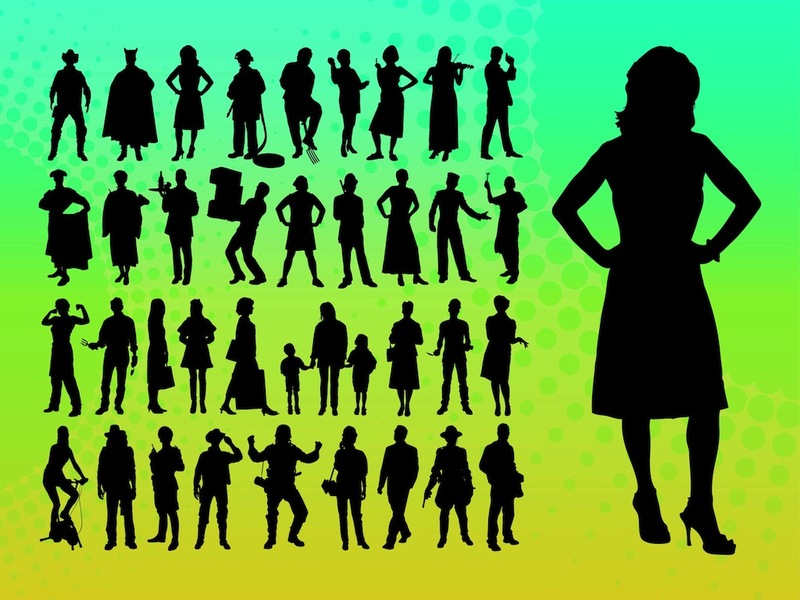 Silhouette vector graphics of various people engaging in different activities. Great variety of body types, heights, clothes, accessories, body positions and actions. Free vector graphics to use in your jobs, professions, working, hobbies, leisure time and everyday actions projects. Man, woman, boy, girl and child silhouettes. People sporting, dressed up, working and enjoying life. Cool footage pack with cowboy, devil, housewife, fireman, farmer, teacher, violist, musician, detective, spy, matador, waiter, judge, mover, cop, police man, bobby, woman cycling in the fitness, shopping woman, babysitter, model, wild west person and many other useful design elements to use in your layouts. Download silhouettes for posters and flyers. Tags: Accessories, Children, Clothes, Jobs, Men, Sport, Women, Work.